Ceausescu and his wife on this day fled from Bucharest by helicopter. 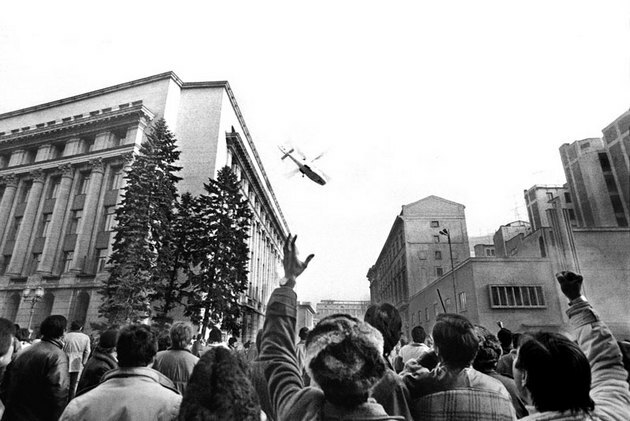 Pilot lied that they will soon be in the range of anti-aircraft weapons, so Ceausescu panicked and ordered the landing. On this day Romanian dictator Ceausescu was arrested, which ended his 24-year-old reign in that country. The revolution against him broke out a few days earlier and spread through the country. Ceausescu thought that he could appease the rebels by offering them a wage increase of 5-10%, but it turned out that all was in vain. During a rally in Bucharest on 21 December, he tried to deliver a speech in front of a large crowd, using socialist rhetoric. The people outspoke him and asked for him to step down. He made a mistake by not leaving the country on that same night. Instead, he waited until the next morning and again tried to suppress the revolution. It was too late. Ceausescu and his wife Elena, who served as a deputy prime minister and was also hated, fled from Bucharest by helicopter on this day. The pilot lied, telling them that they will soon be in range of anti-aircraft weapons, so Ceausescu panicked and ordered him to land. On the road, they stopped a car driven by a local doctor and asked him to drive them. At first he obeyed, but then he faked an engine malfunction and stopped the vehicle. They stopped another car, that of a local bicycle repairman. He took them to an agricultural center nearby, assuring them that they will be able to hide there. However, the director of that institution locked them up, and they were soon arrested by the police. They were taken to jail, where they were retained until the final trial.